The latest edition of the EIA’s Electric Power Monthly was released on March 26th, with data for January 2019. In January, the absolute amount of electricity generated rose back to levels not seen since the end of summer in September 2018, probably as a result of the need for longer hours of lighting during the longer nights, coupled with the increased needs for heating in the middle of winter. Natural Gas contributed 4.86% of new capacity during the month, with 33.29% of new capacity coming from Solar and Wind contributing 60.57%. Natural Gas, Solar and Wind made up 98.72% of new capacity in January. In January, the absolute amount of electricity generated rose back to levels not seen since the end of summer in September 2018, probably as a result of the need for longer hours of lighting during the longer nights, coupled with the increased needs for heating in the middle of winter. 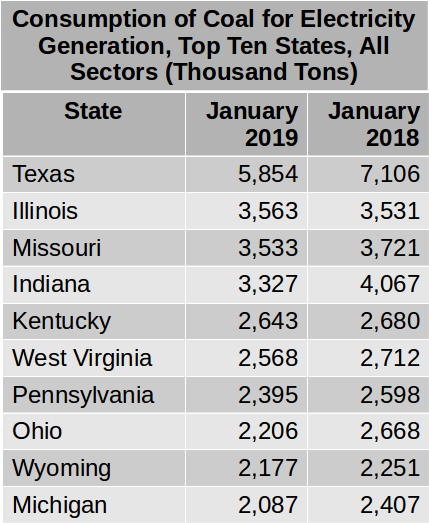 Coal and Natural Gas between them fueled 61.49% of US electricity generation in January, with the contributions from Nuclear and Conventional Hydroelectric declining. The contribution from Natural Gas was up at 33.25%, from 31.71% in December, with the amount generated rising from 106,978 GWh to 118,935 GWh. Generation fueled by coal increased from 96,825 GWh to 101,019 GWh, resulting in the percentage contribution falling from 28.70% to 28.24%. The amount of electricity generated by Nuclear plants increased from 71,657 GWh to 73,701 GWh with the resulting contribution actually declining from 21.24% to 20.60% in January. The amount generated by Conventional Hydroelectric increased from 23,728 GWh in December to 24,544 GWh in January, with the resulting contribution decreasing to 6.86% as opposed to 7.03% in December. The amount generated by Wind increased from 21,154 GWh to 22,493 GWh, with the resulting contribution rising very slightly from 6.27% to 6.29% in January. The estimated total solar output rose from 4.962 GWh to 5,859 GWh, with the resulting contribution rising from 1.47% to 1.56%. The contribution of zero-carbon or carbon-neutral sources declined from 38.59% in December to 37.41% in January. 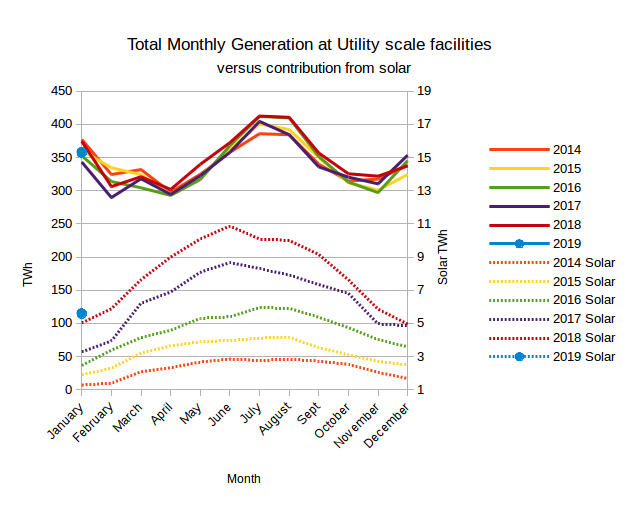 The chart below shows the total monthly generation at utility-scale facilities by year versus the contribution from solar. The left-hand scale is for the total generation, while the right-hand scale is for solar output and has been deliberately set to exaggerate the solar output as a means of assessing its potential to make a meaningful contribution to the midsummer peak. In January 2019, the output from solar at 5,590 GWh was 2.94 times what it was four years ago in January 2015. 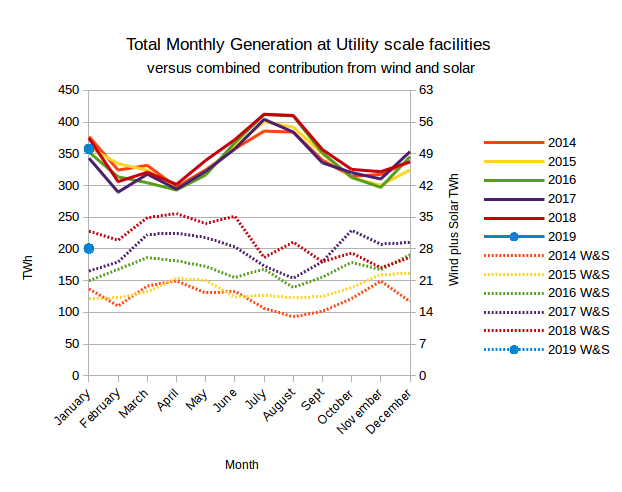 The chart below shows the total monthly generation at utility-scale facilities by year versus the combined contribution from wind and solar. The left-hand scale is for the total generation, while the right-hand scale is for combined wind and solar output and has been deliberately set to exaggerate the combined output of solar and wind as a means of assessing the potential of the combination to make a meaningful contribution to the year-round total. 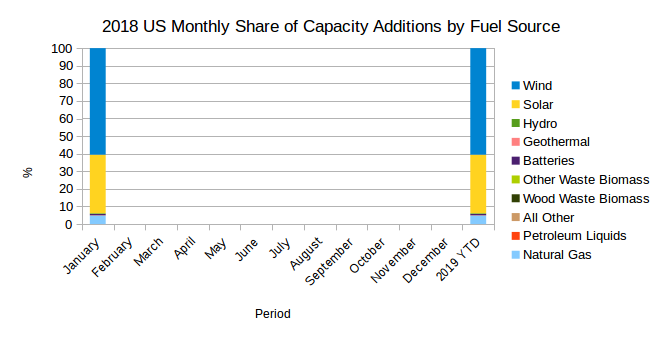 The chart below shows the percentage contributions of the various sources to the capacity additions for January 2019. In January, Natural Gas contributed 4.86% of new capacity, with 33.29% of new capacity coming from Solar and Wind contributing 60.57%. Natural Gas, Solar and Wind made up 98.72% of new capacity in January. Natural gas and renewables have made up more than 95% of capacity added each month since at least January 2017. A portion of the capacity added that was not fueled by Natural Gas, Wind or Solar was a 6.5 MW Conventional Hydroelectric facility, owned by a company involved in sugar manufacturing, based on the Hawaiian island of Kauai. There were also two battery installations, one a 10 MW facility in Gilbert, Arizona, and the other a 1 MW facility set up by the Southern Indiana Gas & Electric Co. in Indiana. The only other facility that was not fueled by Natural Gas, Wind or Solar was a 2 MW diesel unit set up by the City of Tipton, Iowa. The 74 MW of Natural Gas-fueled capacity added consisted of four 18.5 MW Natural Gas Internal Combustion Engines at the Hopkins plant in the City of Tallahassee, Florida. In January 2019, the total added capacity reported was 1,523.5 MW, compared to the 1,617 MW added in January 2018. 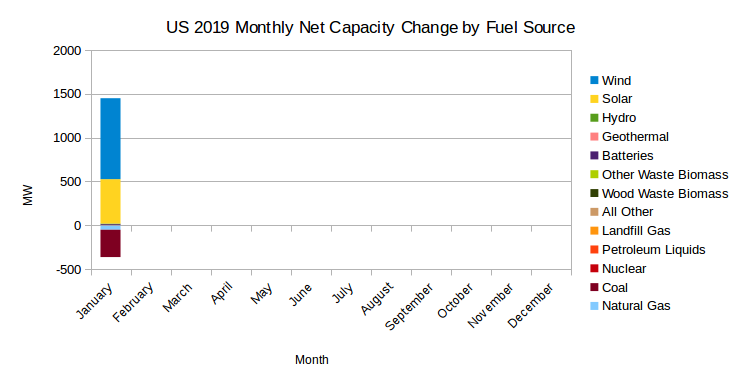 The chart below shows the monthly capacity retirements for January 2019. In January, the only retirements reported were a 121 MW Combined Cycle Gas Turbine, owned by an independent power producer in Florida, a 3.8 MW Natural Gas Steam Turbine in Tuscola Illinois and the 312 MW Conventional Steam Coal plant at the Henderson Municipal Power & Light Station Two in Henderson, Kentucky.